Happy birthday to the Rev. Dr. Martin Luther King Jr., whose commitment to justice made so much possible. May his memory inspire everyone’s Day of Service. Selma is still playing at Sunny Isle through Wednesday. Today, 3-6pm: Sweet salad mix, baby spicy salad mix, microgreens, arugula, dandelion greens, cucumbers, loads of tomatoes all types, cherry tomatoes, radishes, Italian basil, holy (tulsi) basil, garlic chives, mint, dill, recao, escarole, lettuce heads, small quantities of sweet corn, zinnia flowers. From our partners we have vegan ice cream, a perfect little afternoon treat from I-Sha. Coconut is good for you! 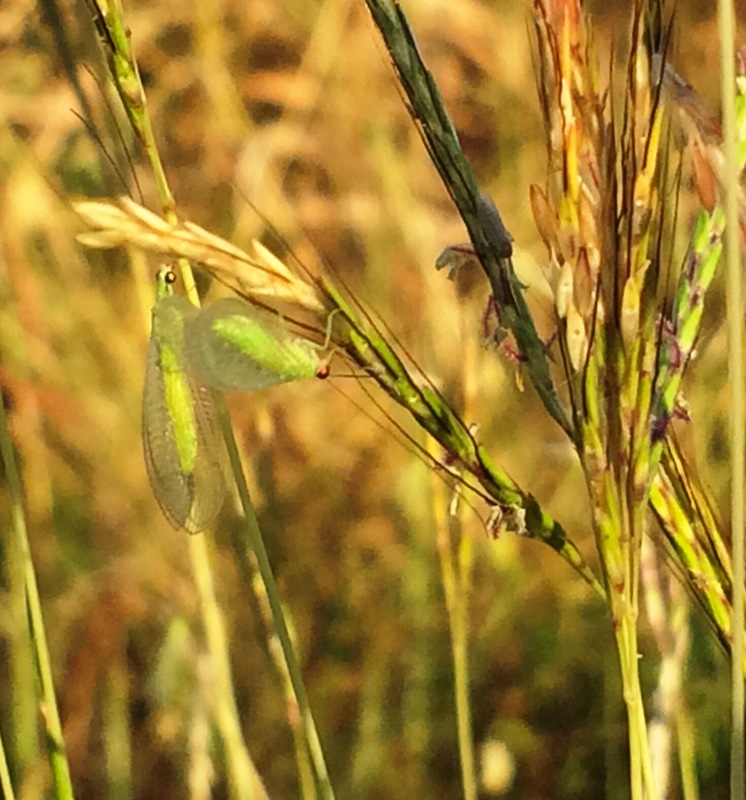 Beneficial lacewings drying out from heavy dew on seeding hurricane grass. 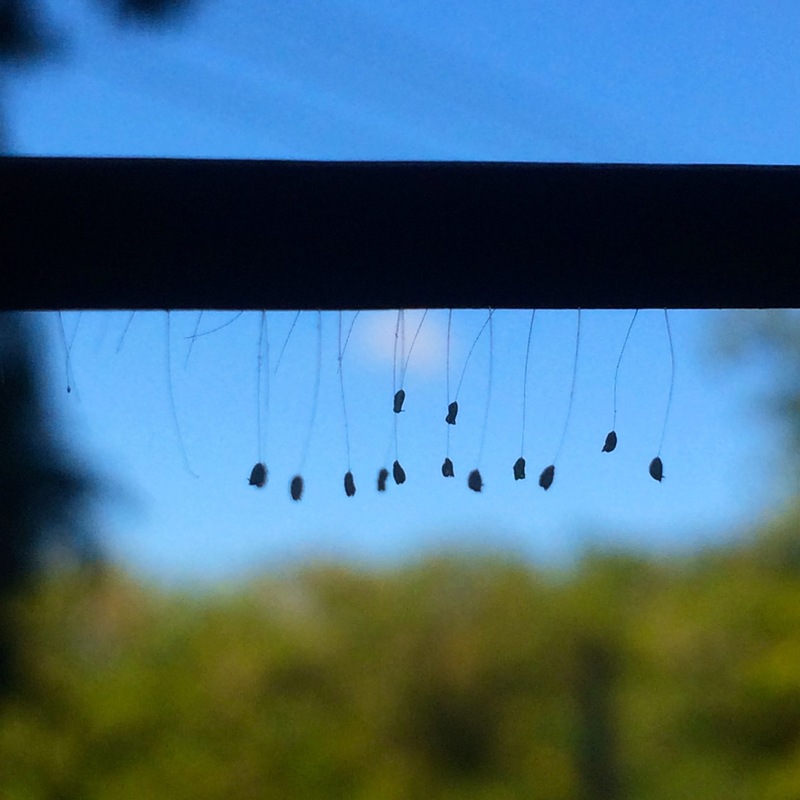 Lacewing eggs look like tiny threads with white dots suspended from them and can be found on any grass-like structure, including the laundry line. Know Your Farmer Monday @ ARTfarm. Open 3-6! Q: Are centipedes good or bad? A: Of all the creepy crawlies that quickly scurry under the bed at night, Virgin Islanders love to hate centipedes. But centipedes are top predators in the insect world. This makes them extremely beneficial for an organic vegetable farm. 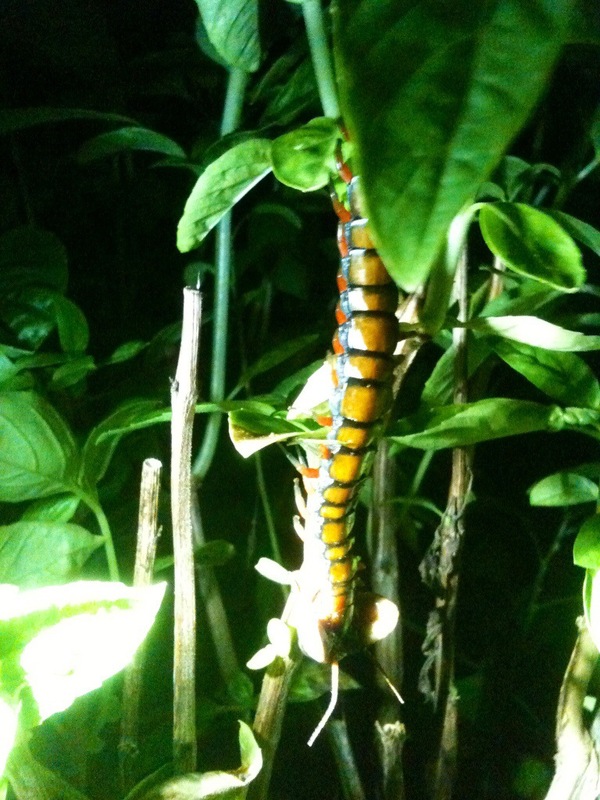 Centipedes take the night shift from wasps and birds, hunting and devouring slugs, caterpillars, cockroaches and countless other garden vegetable pests from dusk till dawn. In turn, centipedes themselves become a rich protein feast for birds and other omnivores further up the food chain. It takes a year for the average centipede to reach sexual maturity. The mother will lay a small number of eggs and then protect them devotedly with her body until they hatch. If you pick up an object in the garden and find a centipede curled up in the soil underneath who doesn't immediately scurry away, it's probably a mother protecting her brood. Take the opportunity to look closely at her. Centipedes can have incredible rainbows of color from red to yellow to bright blue and purple in their exoskeletons, with delicate little legs perfectly aligned in a celebration of fractal beauty. A centipede delivers a venomous bite through specially modified front legs near their head. A centipede bite is not typically deadly for humans or pets, but can give a strong reaction like a bee or wasp sting and should be treated as such. Centipedes have terrible vision and can only see light and shadow. This is why, when you switch on the light in a dark room, a centipede may scurry toward you. They are not attacking you, but are simply trying to get out of the light, and your shadow is appealing to them. If you have a lot of centipedes in and around your home, one of the most effective ways to get rid of them is to keep a chicken loose around in your yard. Laugh if you will, but integrated pest management is an important part of managing pest loads on an organic farm, and the delicious eggs are a big plus. Monday's stand, open 3–6 p.m., Transfer Day 2014: Freshly made sweet salad mix, spicy salad mix, arugula, beautiful carrots, Bodhi beans, chili peppers, cherry, plum, heirloom and slicer tomatoes, and passionfruit. Raw local honey from Errol, and Wanda's fantastic honey mustard dressing and honey mead sampler gift boxes, as well. A lovable animated centipede stars in this family movie from the Roald Dahl book, James and the Giant Peach! 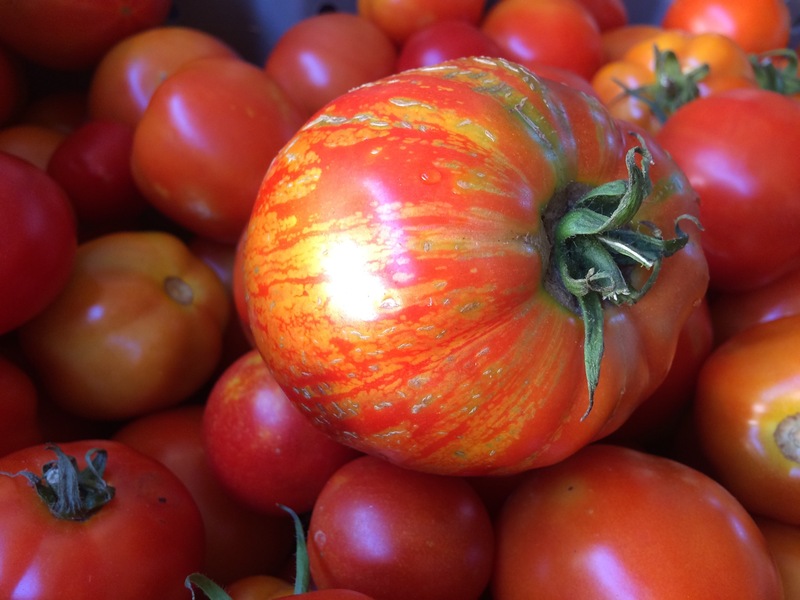 ARTfarm Q&A Monday with Farmer Luca! Open 3–6, Rain or Shine! 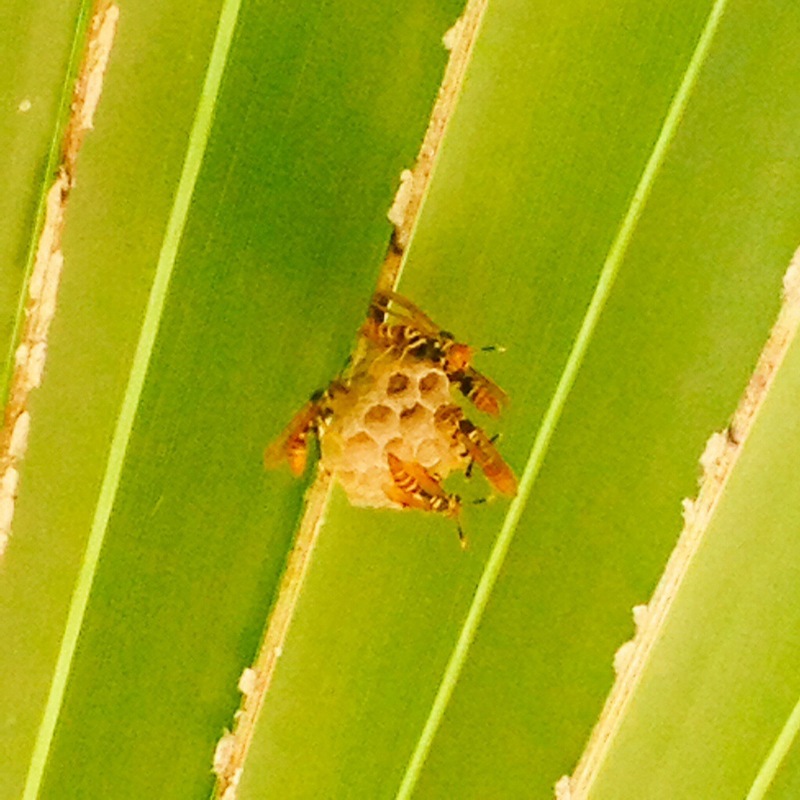 Q: Are Jack Spaniards (aka yellowjackets, paper wasps) good? A: They are. They eat caterpillars off of our tomato and lettuce plants. So we consider them a “beneficial” insect, along with praying mantises, honeybees, ladybugs and lacewings. Jacks do deliver a nasty sting, but only when their nest is disturbed. As long as their nest is not in a high-traffic area, we let them stay. 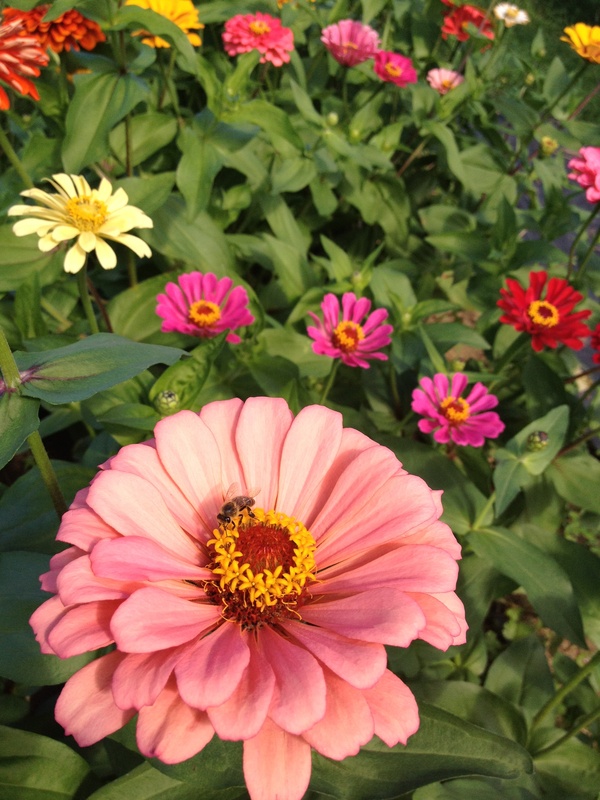 These beneficials do the work of insecticides, so that we don’t need to spray chemicals on our plants and soil. Monday’s harvest: Sweet salad mix, spicy salad mix, microgreens, cooking greens, cilantro, carrots, radishes, lots of tomatoes in a variety of colors, shapes, and sizes by the pound, cherry tomatoes by the pint, vegan ice cream. ARTfarm Saturday Morning… Eat Us! Do like this little honeybee is doing - fill your shopping bags with healthy, local, natural fare for making meals at home that will nourish your body and your family! Microgreens, sweet mix, spicy mix, arugula, endive. Broccoli rabe, chicory, kale, collards, holy, lemon and italian basils, garlic chives, dill, cilantro, lemongrass, cucumbers, cherry tomatoes, a few large slicer tomatoes, papayas, and coconuts…and giant colorful zinnias! Don’t forget the chocolate, including Alisha’s new revamped Sweetface coconut truffles with the purple raffia… they are little clouds of joy! Don’t forget about our native trees! Don’t we all have a spot in the yard that needs a little carbon sequestering? Put in an appearance at ARTfarm on Saturday morning! 10am – 12 noon tomorrow! Lettuce Be Happy at Saturday’s ARTfarm Stand! 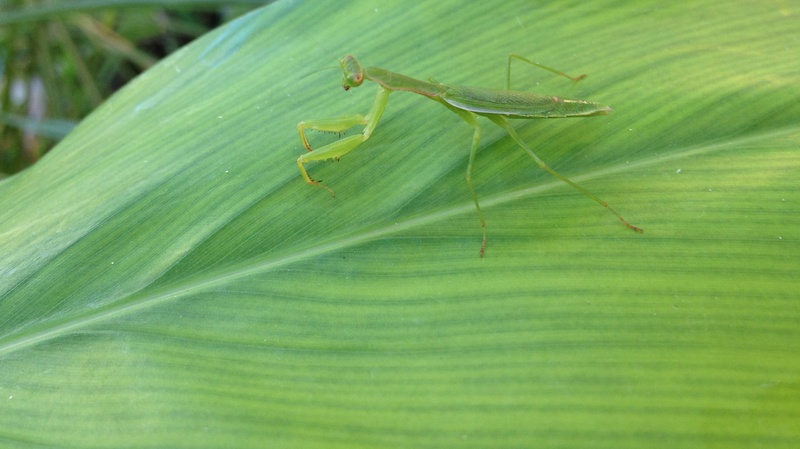 Can you spot the praying mantis on this galangal leaf? We found a whole bunch in the basil harvest this morning. These insects are highly beneficial and are perhaps the only insect with an articulated head. Crazy tons of lettuce and fresh greens for Saturday’s stand coming up at ARTfarm! Start planning your fresh local Thanksgiving dinner with food grown mere fractions of miles from your home or restaurant kitchen! We’ll have lettuce heads in festive holiday colors, frizeé endive, sweet mix, spicy mix, arugula and microgreens. Bunched cooking or juicing greens including kale, collards, chinese cabbage, baby bok choi and broccoli rabe. Herbs fresh cut the morning of: italian and thai basils, dill, garlic chives, lemongrass, holy basil. For holiday gifts, we have zinnia flowers, homemade chocolates, local honey, crispy salty foccacia bread, fresh precut coconuts for sweet coconut water, native potted shade trees, and ARTfarm gift certificates. If you’re planning a holiday event and need to order lots and lots (5+ bags) of salad mix or microgreens, call us a day or two before the farmstand at (340)514-4873 and we can prep a special order just for you.